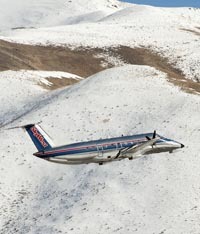 Hailey Mayor and Friedman Memorial Airport Authority board member Fritz Haemmerle on Tuesday accused Blaine County of not wanting to proceed with a replacement airport or any siting studies, saying the county was “just giving lip service” to the idea of a long-term replacement. The authority board met to discuss the possibility of asking the Federal Aviation Administration to terminate an environmental impact study regarding two preferred sites for a replacement airport. The study was suspended in August 2011 when the FAA told the community it was uncertain whether it had the finances to continue with either replacement option. Since the EIS was suspended, Haemmerle and other Hailey city officials have expressed concerns that “temporary” expansion of the airport in its current location could become a permanent solution, and have urged the FAA to continue the process of airport relocation. Permanent termination of the EIS would allow the authority to move forward with a master planning process that would involve finding a new, more affordable site and possibly lengthening the time for the authority to find funds to build the airport. But Haemmerle said he would not be willing to terminate the EIS until he was convinced that the county is willing to move forward—which he is not, he said. “It seems the county wants to move forward with a vague process, the vaguest of vague processes, and just talk about a dual path,” he said, adding that he has not heard a county commitment to relocation yet and that he wants to see a commitment to performing a study on potential sites. Hailey representative Susan McBryant agreed, saying she imagines that everyone would welcome the information from a study of alternative sites. County Commissioner and Airport Authority member Larry Schoen bristled at suggestions that the county was not committed to a replacement airport as a long-term solution. The county is concerned about how to pay for a replacement airport and the prerequisite studies, he said. Haemmerle argued that finding sites would help the county and the authority budget for a future replacement airport, and supported board member Ron Fairfax’s suggestion that the authority request a stand-alone site selection study from the FAA as soon as plans for modifications to the current airport are completed. He urged the authority to support a request to the FAA to terminate the EIS, conditioned on a stand-alone study’s being started within six months or initiation within three years of a master planning process that would include a site study. But Schoen and fellow Commissioner and authority board member Jacob Greenberg balked at the motion, saying they needed financial information on how much a site study would cost. “I think we need to be prepared to pay for something like that before we commit to doing it,” Greenberg said. Schoen pointed out that, according to the joint powers agreement that governs the authority, Blaine County representatives can decide only on matters involving the replacement airport. Acting Chair McBryant decided to table the issue until next month’s meeting, stating that she would discuss the issue of who could vote with the county and city attorneys as well as airport staff. The authority also decided Tuesday to approve a scope of work from Boise-based T-O Engineers that would allow the company to form a detailed plan for modifications to the current airport site. T-O Engineers Aviation Services Manager Dave Mitchell said the FAA has already reviewed and approved an outline of the report, and that the next step will be to develop a cost estimate. Construction is expected to begin this summer, and will include a parallel taxiway and moving or dismantling of nine existing airport buildings.